Using the tools of contemporary semiotic theory to analyze classical rabbinic hermeneutics and medieval mystical exegesis, Betty Rojtman unveils a striking modernity in these early forms of textual interpretation. 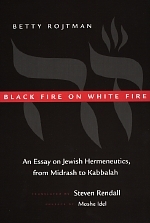 The metaphor from rabbinic literature that describes the writing of the Torah—black fire on white fire—becomes, in Rojtman's analysis, a figure for the differential structures that can be found throughout rabbinic discourse. Moving through the successive levels of traditional commentary, from early Midrash to modern Kabbalah, Rojtman examines the tension between the fluidity and nuance of the biblical text and the fixed commitment to ideological and theological content. To examine this strain between open text and sacred language, Rojtman scrutinizes the demonstrative, "this," as a word whose significance changes with every change in context. Her analysis suggests a double-layered meaning for "this," which refers to the existential world in its multiplicity but also to transcendence and the eternal presence of God. Betty Rojtman is Professor of French and Comparative Literature at the Hebrew University in Jerusalem and Director of the Desmarais Research Center for French Culture. Steven Rendall is Professor of Romance Languages at the University of Oregon and editor of Comparative Literature.